There are only 15 weeks left of reading this year!! I’m a book nerd. That kind of data makes me anxious because I think of all the books I set out to read and sadly my year has been less than stellar. So following The Broke and The Bookish‘s meme to list Top Ten Books on my Fall TBR, I decided to go with short stories. I have NO IDEA what novels I want to squeeze in before the year’s end but I do have an inkling of some short stories that I’ve missed this year and one soon to be released that has caught my eye. I don’t expect to get all ten of these read but I’m hoping for a few. Click on each title for the full synopsis on Goodreads. All of these authors are new to me, except for Shirley Jackson, so I am excited to finally read some of their work. Any other short story collections from 2015 I might have missed that you recommend? What’s on your Fall 2015 TBR list? 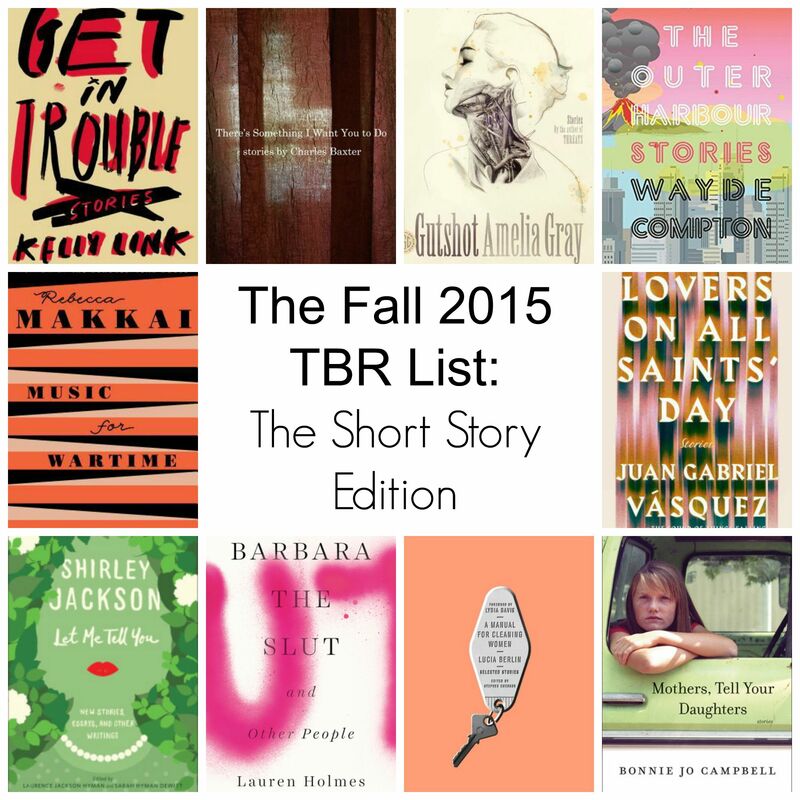 Tags: 2015 Short Stories, Fall 2015 TBR list, The Broke and the Bookish, top ten tuesday. Bookmark the permalink. I’m not much of a short story reader, but I am interested in Mothers, Tell Your Daughters and I’ve also heard good things about Rebecca Makkai. I’ve had Makkai on my list for some time and finally got a copy from the library. Right? From what I’ve read, it’s a compilation of Berlin’s best work focusing on stories of everyday people. She died in 2004 and there wasn’t a book out by her since the late 90s, so I guess a gathered collection was the plan. I haven’t read any of her work so not sure of the tone, etc. But it does sound interesting! So happy to see some of these on your list, you are such a great guinea pig when it comes to what short story collections I might like. Because I’m kind of woeful in that category, as you know. I tried Gutshot after hearing great things and didn’t get very far. Maybe you can turn me around. I am in line for Manual for Cleaning Women and quite excited to get that one, actually. The Link and Campbell titles are also on my radar, so I’ll be looking forward to your thoughts on those! Great list. I’m behind on my goals this year too but can always squeeze in a short story or two. Definitely a collection of the “all the sadness in the world just congregated in my chest” variety, but so good.